Fran Wilde’s “Updraft” is one of my most anticipated books of 2015 and there is a good reason for this. Actually, there are a couple more reasons than one, but the most important thing is that I am waiting with anticipation the month of September when “Updraft” will be released by Tor Books. I’ve discovered Fran Wilde’s writings through her short stories, this wonderful method of discovering excellent fiction and broadening the list of writers to read, “The Topaz Marquise”, “The Naturalist Composes His Rebuttal” and “Nine Dishes on the Cusp of Love” being the tales that made me very interested in Fran Wilde’s writing career. Further to the point, short and longer fiction are two different beasts and I am always curious how some of my favorite authors make the transition from one to the other, a curiosity soon to be satisfied in this case by the release of “Updraft”. Fran Wilde’s series of interviews “Cooking the Books” are a delight and delicious treat that gorged my voracious appetite for genre fiction in the most original way. And last, but not least, the synopsis of “Updraft” sounds very enticing, a city of living bones, flying devices and a secretive governing body are all elements that draw me toward the novel. We also have a cover to go with the synopsis and although I cannot honestly say that it is among the best books covers I’ve seen (a consideration entirely subjective), it still does a very good job in capturing the atmosphere and concept implied by the synopsis. The city of bones receives a face, with the towers of bones and the lights shining through them, the glider holds the same promise of adventure as the synopsis does and the clouds and sky reflect the feeling of depth promised by the presentation of the novel. I might not be as thrilled by this cover as I am by others but overall the artwork is definitely a solid job. 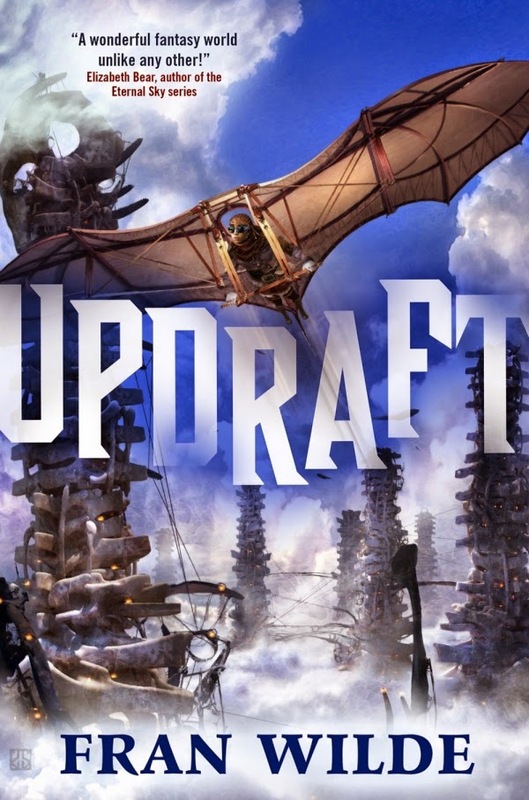 I have no regret whatsoever in placing Fran Wilde’s novel on my list of most anticipated books of 2015, not that there was any trace of such a thing, because only by the sound and looks of it “Updraft” is a book I would like to read in any condition.